We have two talks today at the Auditorium at the SL10B Community Celebrations. 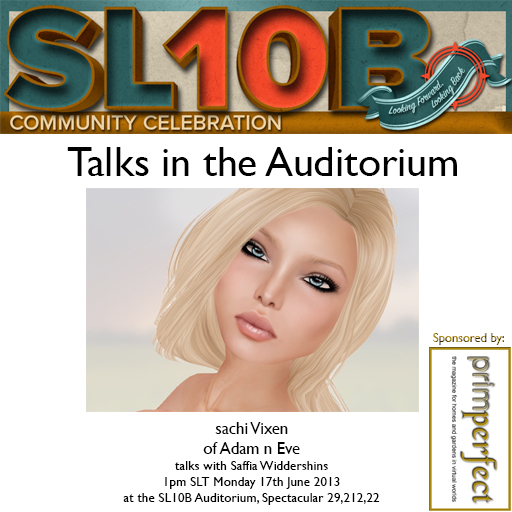 Firstly, at 1pm SLT, I will be talking to sachi Vixen, of the fabulous Adam n Eve store. Some of my earliest outfits in Second Life came from Adam n Eve – I was delighted to find a store that made beautiful clothes for the businesswoman, as well as elegant evening gowns. Then, at 3pm SLT Rowan Derryth will be talking to the artist Gracie Kendall – you can see more details of that here. Next Post: Have you collected your free gifts and voted in the SL10B CC photo contest yet?